Cyclin H antibody LS-C358931 is an unconjugated rabbit polyclonal antibody to Cyclin H (CCNH) from human, mouse, rat and other species. Validated for IHC and WB. CCNH / Cyclin H antibody was raised against kLH-conjugated synthetic peptide encompassing a sequence within the C-terminal region of human Cyclin H.
Immunizing peptide used to generate LS-C358931. Useful for pre-absorption and neutralization of the antibody's antigen binding site. Recognizes endogenous levels of Cyclin H (pT315) protein. 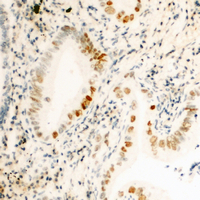 Immunohistochemical analysis of Cyclin H (pT315) staining in human kidney formalin fixed paraffin embedded tissue section. The section was pre-treated using heat mediated antigen retrieval with sodium citrate buffer (pH 6.0). The section was then incubated with the antibody at room temperature and detected using an HRP conjugated compact polymer system. DAB was used as the chromogen. The section was then counterstained with hematoxylin and mounted with DPX. Western blot analysis of Cyclin H (pT315) expression in Jurkat UV-treated (A); A549 UV-treated (B) whole cell lysates.